Despite the uncertainties generated by the volatility in oil prices and the significant drop in government revenue, the Nigerian economy will continue to grow, even if oil prices fall to $35/bbl and average just $45/bbl in 2015, provided there is no deterioration of the political and security landscape. In the long term however, Nigeria’s policymakers must encourage a more resilient economic model, fit to harness the country’s strong growth fundamentals. This is among key findings in the latest Nigeria Economy Watch report released in Lagos today by leading professional services firm, PwC. Titled What next for Nigeria’s economy? 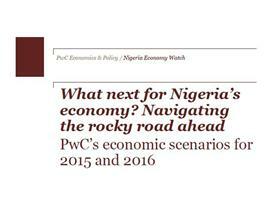 Navigating the rocky road ahead, the report presents PwC’s economic scenarios for the country for 2015 and 2016 and draws on three possible economic scenarios developed by the firm’s economic team to help both public and private sector organisations prepare for an uncertain environment in 2015 and 2016. According to the report, a large services and agriculture sector has developed independently of the oil sector, and this should help to insulate the real economy from a downturn in oil prices. However, any deterioration of the political and security landscape could unnerve investors and tip the country into recession. 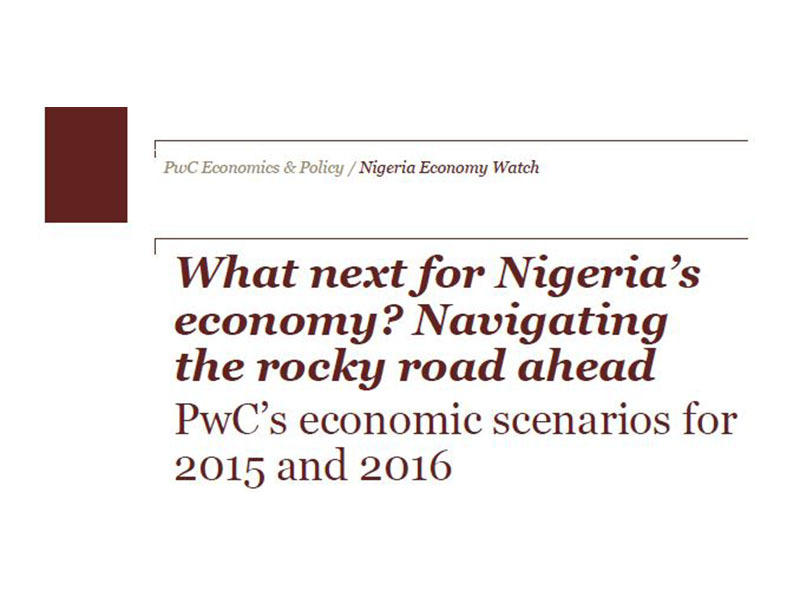 If a ‘medium’ political shock occurs against the backdrop of a severe oil price scenario, the report predicts that Nigeria’s economy could see zero growth or even contract in 2015 and again in 2016. “We explored two types of shocks in the report: an oil price shock and a political shock. The first scenario looks at oil price averaging $55/bbl over 2015 and stabilising at $70/bbl in 2016 with a smooth transition and maintenance of political stability in the country. Scenario 2, envisages the re-emergence of Iran oil production in Q2 of 2015 which could drive oil prices to as low as $35/bbl and reaching a new equilibrium level of $60/bbl in 2016 consistent with the most bearish forecasts from analysis. The third scenario follows a similar pattern as scenario 2 with oil prices averaging $45/bbl in 2016 in addition to severe political or security shock arising from escalation of Boko Haram insurgency and/or resurgence of restiveness in the Niger Delta. Our modelling and forecasts show that while the economy will continue to struggle even under the most benign scenario, it will be able to realise growth averaging 4.0% for the period. “Despite oil’s importance to Nigerian exchequer, the real economy is largely insulated against falling oil prices. This is driven by the fundamental structure of Nigeria’s economy and how the oil and public sectors interact with the non-oil sector. 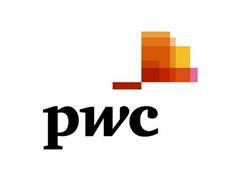 PwC’s economists expect that if the oil price continues to stabilise, the Central Banks’s recent adjustment of the exchange rate regime will be sufficient to ease pressure on the Naira in 2015. However, if oil prices deteriorate further, a further c.10% devaluation of the Naira will be necessary in 2015. When combined with capital flight from a political or security shock, the report projects that the Naira will fall by a third against the USD by the end of 2015, matching the extent of the devaluation expected by the futures market at the height of the pre-election volatility in February. The report also noted that if recent oil production trends continue, gross government oil revenues will fall dramatically from their 2013 level: by $21bn alone in Scenario 1 (equivalent to a 50% decline). In this case, a c.$5bn revenue shortfall is likely to emerge in 2015 compared to the outgoing administration’s budget calculations. This financing hole could widen to c.$10bn in Scenario 2, where significant debt issuance and cuts to recurrent expenditure will be needed. State governments could struggle to borrow on financial markets or pay their workers. According to the report, some highly-indebted states may miss planned interest payments on their debt. If oil production fall by 15% as envisaged in scenario 3, through bunkering and other supply disruptions, gross oil revenues would fall to a third of their 2013 level. Combined with difficulties administering tax collection from unstable parts of the country, we would expect the federal government to fall over three months behind on paying employee wages and government bond yields on US$-debt could approach 20%. “In the short-term, Nigeria’s policymakers have relatively little ability to influence which scenario the country may enter (particularly relating to the oil price). However, policymakers can take actions that will help mitigate the potential impact on the economy if a crisis does materialise. On the monetary policy side, the central bank will need to take the lead in closely scrutinising the evolving risk environment, particularly around market, credit and liquidity risks. It should stand ready to intervene with a wide-ranging toolkit including extensive liquidity facilities and contingency plans for maintaining the cash money supply in regions inflicted by bouts of instability. The Government can also take responsibility for developing a set of priorities for federal and state expenditure, aligned to the national development plan. A policy principle might be to protect and support a few strategic industries during a crisis period, such as agriculture and MSMEs, which provide a large number of jobs to citizens.